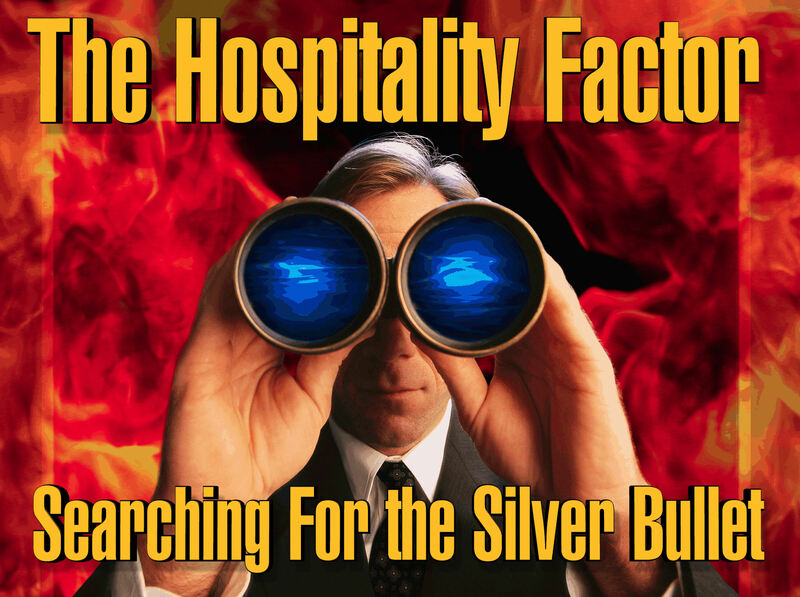 It is ironic that the competitive element most responsible for success in the hospitality business . . . and the piece most often missing . . . is hospitality itself! If all 945,000 eating and drinking places in the United States profess to be in the hospitality business, why do so few stand out for actually being hospitable? You can be adequately fed and reasonably well-served in most restaurants, but how often do you experience heart-felt caring and personal connection -- that warm feeling that tells you the restaurant's staff is delighted you are there and it matters to them that you have a great time? We often speak of service and hospitality in the same breath, but they are really quite different. Service is the efficient execution of a series of actions. It is procedural. Hospitality, on the other hand, is interactive; an exchange of energy at some level between staff and guests; a genuine human connection. Hospitality is intensely personal ... which is what makes it impossible to standardize into a process. You can readily recognize hospitality when you experience it, yet you really can't define it any more than you can describe your love for your family in a way that would give others the same feeling. Trying to "teach" hospitality presents a similar dilemma -- it is generated by the states of mind of the leadership and the staff, not from any specific actions. "Hospitality is the foundation of my business philosophy. Virtually nothing else is as important as how one is made to feel in any business transaction. Hospitality exists when you believe the other person is on your side. The converse is just as true. Hospitality is present when something happens FOR you. It is absent when something happens TO you. Those two simple prepositions -- for and to -- express it all." Does Danny's notion of hospitality work? Consider this: there are 22,000 restaurants in New York City. In the annual Zagat diner survey, every fine dining concept owned by Danny's Union Square Hospitality Group (USHG) is consistently in the top twenty on the Most Popular list! Even more amazing is that his Union Square Café has been voted the Most Popular Restaurant in New York City every year since 1997 ... except for four years when the top spot went to Gramercy Tavern -- another USHG restaurant -- and Union Square Café "slipped" to #2! Danny admits that he never takes top honors for Best Food or Service, but when New Yorkers name their favorite restaurants, he has owned the top two spots ... out of 22,000 ... in arguably the toughest and most demanding restaurant market in the country ... for twelve years straight! Impressive! The message is clear: To be exceptionally successful, you don't have to be the best at everything you do, you just have to be the favorite of the people you do it for. This attests to the power of hospitality. How do you train them to become more effective in the way they ARE? The Bad News: The spirit of hospitality cannot be taught as if it were another job skill. The Good News: You don't need to teach it. Like the ability to love, hospitality is an innate capability of all human beings. You just need to understand how to create and sustain a climate where it can emerge and blossom naturally. The Great News: You may already know WHAT works, but when you really understand WHY it works, maintaining that warm feeling becomes remarkably effortless. In their endless quest to build sales, operators have tried coupons, e-mail, discounts, celebrity chefs, confusing cuisine and endless promotions. They have tweaked operating formats, revised menus and embraced the latest technology, always looking for the elusive "silver bullet" that will save them. It is an endless treadmill ... and it is exhausting. Re-Discover the REAL Basics Of Our Business! Hospitality is your unbeatable competitive advantage. It doesn't come from what you DO and you can't define it, but you know it when you FEEL it ... and your guests do, too. You can't fake love and you can't pretend hospitality -- everyone recognizes a lack of genuine caring. Hospitality MUST be heart-felt or it won't have any real impact on your patrons ... and it won't last. Hospitality exists naturally in a positive, supportive work climate ... and the climate of an organization always reflects the mindset of the leader. For better or worse, the thinking at the top influences the entire staff. So infusing your operation with the spirit of hospitality is less about what you do and more about how you THINK about what you do. The only person in the industry who addresses this very different model of management is Bill Marvin, The Restaurant Doctor. He will be your guide as you discover how to create a more hospitable climate, attract the best staff, dominate your market ... and get your life back! If you're up for the challenge of making hospitality your competitive edge ... if you see value in creating mutually-supportive relationships with your staff and guests ... you will want to be part of this eye-opening workshop. You are also invited to stay for a bonus session that will introduce several new resources to help independents stay on track and explain how (and why) to actually become certified as A Place of Hospitality™. Bill Marvin, The Restaurant Doctor, is a leading authority on how good restaurants can become exceptional. He helps independent operators create organizations that can prosper in tough times and bring out their workers' natural ability to deliver memorable hospitality. Bill began his hospitality career washing dishes (by hand!) when he was 14. He's has had his name on the loans, the keys in his hand and the payrolls to meet. His hands-on management experience includes restaurants, hotels, clubs and institutions. A prolific author with a dozen books in print, he is a thought-provoking speaker and a personal coach. His weekly e-letter goes out to 5000+ independent operators around the globe. Bill's professional passion is now devoted to triggering a contagious resurgence of hospitality in the world. You Have A Secret Weapon. Use It! National chains can probably out-perform you, but performance is no longer the differentiating factor. Danny Meyer's amazing success proves the secret to longevity is simply to become (and remain) your guests' favorite restaurant. When people talk about their favorite, they're talking about what a place does FOR them ... and that means that hospitality is present. Are YOUR guests talking about YOU this way? Better yet, when people are treated with respect and compassion, they tend to "pay it forward" ... and we can certainly use more courtesy on the planet! What better way to trigger a worldwide resurgence of hospitality than through the hospitality industry itself? And what better place to start than in YOUR restaurant?